So the past few months have been a whirlwind of planes, trains, beaches and sandy shoes. And I wouldn’t trade in a single second. I’ve strolled along the Miami boardwalk with my girlfriends, enjoyed the sunset on a Caribbean beach with my boyfriend and even taken part in a spot of snow yoga with new friends, high in the Swiss alps. But as much fun as travelling can be, it does also leave you feeling a little bit out of sync. All the time differences, jet lag, dinners out can leave you feeling, for lack of a better word, sluggish. And while a two-week holiday can easily be recovered from, when you’re on the go a little more – it’s important to try and reinstate a routine as much as you can, so that you enjoy your destination to the very fullest! Staying fit and healthy while travelling (and especially if you have a zillion intolerances, like me) can seem like a daunting task, but it’s definitely do-able and I’m here to show you how! Obviously when you arrive at a new destination, you’ll want to sample the local cuisine – and I’m totally all for this! Make the very most of your exciting new surroundings (and the culinary delights that come with it) by taste testing the countries delicacies, but also be somewhat mindful of what you’re putting into your body. I suppose it’s all about balance, as always! For example, Mexico is famed for it’s cheesy, creamy dishes – which obviously you NEED to indulge in, but too much indulging could leave you feeling tired and sluggish, meaning you won’t be able to enjoy the incredible offerings of your new home! Once you’ve had your fair share of delights, try and stick to plain, simple dishes with fresh, healthy ingredients to refresh your body a bit. Some of the best Italian dishes feature just four ingredients, olive oil, tomatoes, chicken and garlic! One of my very close friends Em, is a seasoned jet-setter and she talks in depth about the 80%/20% rule, which is a great motto to remember when you’re on the go! When I first joined a gym a few years ago, I purchased a few personal training sessions and it was the best investment I could have made for myself, as it really kick started my exercise regime and gave me the confidence to go forth and use the gym equipment. Admittedly, prior to this session, I was probably one of those hilarious people who frequented in those much circulated Facebook memes, using one leg to swing myself around the cross trainer. Well, maybe not. But you get the idea, I was pretty clueless. However, when you’re travelling and you don’t always have easy access to a gym (or the inclination to go), then fitting in your daily exercise becomes that little bit more tricky. Obviously by nature, travelling can be great exercise, as you’re often on the move, wheeling heavy suitcases, carrying your backpack and walking to your next destination or flight gate, but it’s also a good idea to fit in 20 minutes or so of slightly harder exercise, just to make sure you’re burning those calories! FizzUp was a discovery I made just before I took off from the runway at Gatwick, en route to Miami. 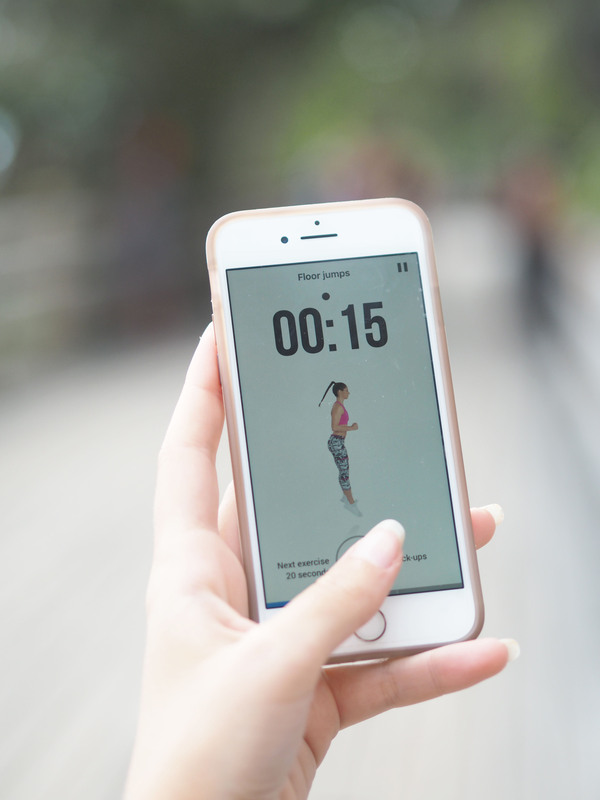 With the premise being you had a personal trainer in your pocket (well, on your phone) at all times, with updated workouts personalised to your abilities and efforts every day, I simply had to give it a try. While I like to think I’m very intuitive and independent in all other aspects of my life, when it comes to exercise, I do need someone to tell me what to do – so to have foolproof instructions and visual videos to copy, was a massive help. As previously mentioned, my willpower and motivation is sometimes tested – and when there’s so many other distractions when abroad, this is certainly something you need to have a lot of. So I love the fact that FizzUp has a community aspect to it’s platform, whereby your followers can praise you for keeping up your ‘rhythm’ (consecutive workouts) and send congratulations when you move up a level and improve your strength and cardio fitness. I have to say, I almost ducked out of my routine on day three, but when a little notification popped up from a friend to say that she congratulated me on yesterday’s workout, I felt a pang of guilt for almost letting her down. While the app is HUGE in it’s native France (1.5 million members and counting), it’s still the UK’s up and coming little secret, so whether you’re a beginner looking to get fit or a seasoned exerciser who wants to measure their progress and improve, the evaluations at every level mean that everyone can join in! Rather handily (because they truly have thought of everything), the FizzUp PRO version also comes with a nutrition guide and recipe ideas, which is amazing at taking you back to the basics of food and re-inspiring your palette. So if you have a few weeks at home in your busy travel schedule, you can get creative with their assortment of delicious concoctions. Yum! For those that want to get even more adventurous with their work-outs, the PRO membership also features add-ons such as optional blocks of cardio, ab workouts, stretching and focus programmes (mini 5 minute workouts to a specific muscle group or area). By essence, it tailors itself to the user and truly encompasses the ‘social’ aspect by allowing you to invite your friends to join in. In fact, they’ve recently launched a new feature whereby if you invite 3 friends to sign up for the app, you’ll unlock your progress reports – which will give you access to your improvements, weak spots and overall fitness level. When you have a whole new destination to explore, the best way to get your bearings and immerse yourself into the culture, is to take the scenic route – or to discover your surroundings on foot. Whenever I arrive somewhere brand new, I love taking an hour or two to walk around outside where I’m staying, see what’s around (making mental notes of where to visit) and ‘stick my nose out’, as it were. Even if you get a little bit lost, it makes things all the more fun and adventurous! I’ve discovered some of my new photo spots, restaurants and places just by doing this, so it’s a tip I always recommend! Always pack at least one pair of comfy shoes or trainers, even if you’re going somewhere super sunny, hot and relaxing. You never know when you might need them – and I have regrettably been caught short on a number of occasions. Lets not remind myself of the time I only packed flip flops on a trip to Vienna – which is such a vast city I actually popped one of the toe straps and gave myself a huge blister, because there was SO much walking involved. It’s worth making sure you have a back-up plan should you need them! As much as travelling is massively fun – and probably the only thing you’ll ever invest in, that will genuinely make you richer in the long run – it’s also stressful, and sometimes we overlook this! Travelling through time zones, weather conditions and over long periods can take it’s toll and sometimes it can all get a little bit overwhelming. I know this has happened to me a few times recently. I’ve been in the most incredible surroundings, feeling like the luckiest girl in the world and yet a wave of anxiety floods through me, completely overshadowing what I’ve got around me. Take time to gather your own headspace, take a few deep breaths, rest up if you need to (a short 20-minute nap can work wonders) and adjust to the present. One of my favourite things to do, especially if it’s somewhere hot and beachy, is to explore bare foot, because it really helps to ‘ground’ you and connect you to the moment. The sound of the ocean is also incredibly grounding, I love aligning my breathing with the sounds of the waves whispering on the sand. I genuinely believe that if I lived by the sea, I would be a much calmer person, because it acts like medicine for my mind! So, there we have it – tips to stay fit and healthy, mind, body and soul, while you’re jet-setting to incredible places this summer! Obviously this isn’t me trying to dictate to you what you should and shouldn’t do (by any means) but I do think sometimes we forget to look after ourselves while we’re travelling – and I think new destinations are best enjoyed when we feel like our best selves! Join FizzUp today and download the app here. If you want to follow my fitness journey (I’ll follow yours back, I promise) then I’m over at ‘ScarlettLondon1’. * Oh and I almost forgot to mention, if you want to be in with a chance of winning a Fizz Up Pro subscription, stay tuned to my Instagram, as I’m giving one away! Are you jetting off anywhere new and exciting this summer? I’d love to hear about your travel plans! Thank you to FizzUp for collaborating with me on this post. As always, all words are entirely my own.